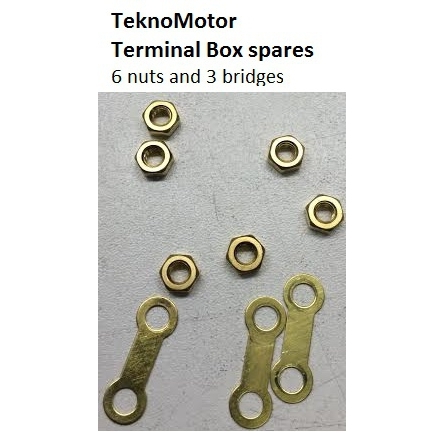 Terminal Box spares (6 nuts & 3 bridges) | DamenCNC B.V. These nuts/bridges are used to make a choice between star/triangle connection of the windings on a TeknoMotor. These are included when you buy a new motor. We offer them also as spare parts, since we often see clients lose parts, and then replace them with normal m4 nuts. This is not something we would advise, since these nuts are made from material that has a better electrical conductivity.